Villegiature Award for Regent Porto Montenegro. 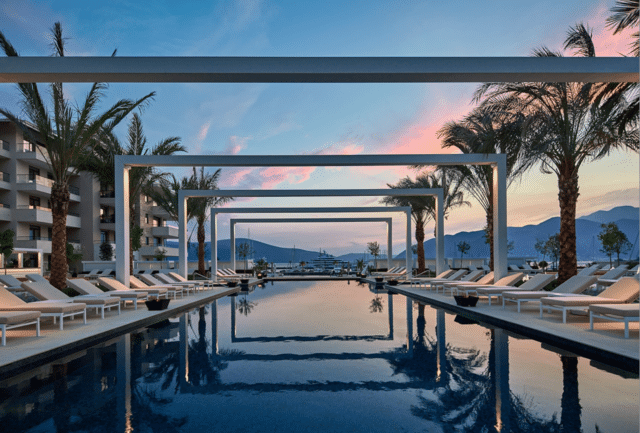 Regent Porto Montenegro is the winner of this year’s “Villegiature” award for the best hotel pool in Europe. A jury made up of 23 journalists from prestigious international newspapers and TV stations, in the strong competition of luxury hotels (Hôtel de Crillon, A Rosewood Hotel – Paris, La Bastide de Gordes – France, Four Seasons Hotel Istanbul – Turkey, Terme di Saturnia Spa and Golf Resort – Toskana Italy and Burj Al Arab, One & Only The Palm both in Dubai, Le Gray Hotel in Beirut and W Amman in Jordan), rewarded the Regent Pool Infinity Pool, located on the Regent Pool Club podium between Baia and Aqua wings. Kai Dieckmann, General Manager of Hotel Regent, who received the prize at the ceremony held at the Ferrières trap near Paris stated that they are extremely honored with this recognition, and that they are particularly pleased about the fact that journalists from prestigious media such as ‘France 2’, TV from France, the Chinese edition of Conde Nast Traveler and Vogue Brazil have recognized the beauty of their exceptional infinity pool as well as its location in the heart of Porto Montenegro, facing amazing views over the Bay of Kotor. This is a confirmation that Montenegro, as a luxury tourist destination, has become not only inspiration for numerous articles in the most popular international media, but the authors of articles announcing new trends in the luxury tourist segment, have awarded the hotel Regent Porto Montenegro and they do see that as a special privilege. Villegiature Awards was created in 2003 and it brings together a jury composed of 22 international journalists and correspondents from well-known world media.